Global Sounds Cafe or the Fireplace Cafe they call it now, was once again closed and we have to 'take it to the streets' and settle for a table along Smith Street downstairs. 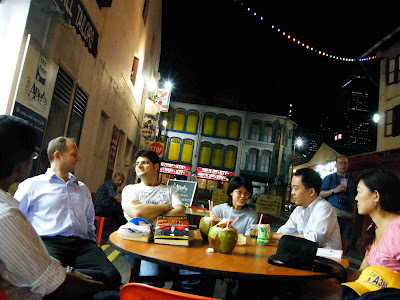 The Futurist Group (Acceleration Aware Group) is an informal group that meets once a week to discuss about the future based on a given theme. We are bankers, students, gold investors, entrepreneurs, webmasters, writers, photographers, teachers, technologists,...etc. If you are interested in what the future may bring you, how it'll affect you or want to enjoy the intellectual exchange of liberal views of the future, this is the place. Anyone can join in the meetings. There is no membership fees to pay. Enjoy! This is the 10th Anniversary of the Tian An Men Incident in 1989. Stefan was there when it happened and experienced it first hand. How will the future of China look like? Will it be a Soaring Dragon? or a Crouched Tiger? China is an ideologically bankrupt nation in that it is no longer a communist economy. They hold the nation together by using the 'we are all Chinese' slogan. It is an illusion as not all Chinese nationals are Han Chinese. In order to keep the country together peacefully, China will have to maintain a certain growth rate to avoid a revolution. It also has to maintain an illusion that such a growth is trickling down to the common people. In recent years, the growth and the policies to maintain such economic growth have been desirable. If Chinese leaders fail to deliver the economic growth promised, there can be despotism and chaos. It is difficult to conceive that there can be a loose federation of Chinese states, just like in the European Union. One of our participants feel that the breakup of China is unlikely and we cannot compare it to the 1920s when the Chinese military only had 4 aircraft fighters and 8 tanks. So far, the Chinese government has advocated the best technological changes that are purely functional to their survival, like the WTO, the Internet and any technology that improves their labour productivity. They are implements that give them incremental advantages over their neighbours. We agree that China and the US are both about the same in their intent as big countries to dominate the world, but the Chinese are more honest. This is so at the moment. It is to be seen if they will behave the same once they become more influential in world affairs. Our Chinese friend (participant) feels that it is still better for China to operate with centralised control as then resources can be shared, even though there are cultural and religious sensitivities in Tibet and Xinjiang. Recently in Guangzhou, two-thirds of the factories had shutdown. 20 million people had to return to the villages. When the export model economy collapse, there could be a breakdown. However, this is very unlikely. The Chinese government now subsidises production of household consumer goods so that they can be made affordable to rural Chinese folks, thus stimulating the demand. One of our participants brought a paper presented by Mingli, an ex-political prisoner in China. He predicts that China will progress as US and Europe will stagnate. 1. That due to female infanticide, there will be a shortfall of women. 30% more men than women in the countryside. How are they going to manage it? The communist party tried to address this shortfall, but has failed. Perhaps, those men that can afford will marry foreigners and those who can't may practise polyandry. Polyandry has inherent advantages of keeping the integrity of farm plots (without fragmenting them by inheritance). 2. That there will be a generation of single child spoilt brats, more notably known as 'Little Emperors'. Will these points above lead to collapse? How often can you peek behind the curtains of one of the most secretive governments in the world? 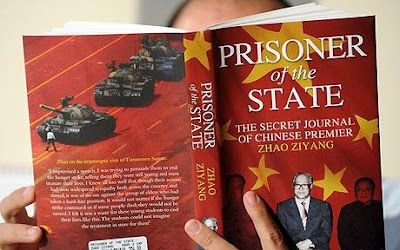 Prisoner of the State is the first book to give readers a front row seat to the secret inner workings of China's government. It is the story of Premier Zhao Ziyang, the man who brought liberal change to that nation and who, at the height of the Tiananmen Square protests in 1989, tried to stop the massacre and was dethroned for his efforts. On the night of June 3rd, while sitting in the courtyard with my family, I heard intense gunfire. A tragedy to shock the world had not been averted, and was happening after all. I prepared the above written material three years after the June Fourth tragedy. Many years have now passed since this tragedy. Of the activists involved in this incident, except for the few who escaped abroad, most were arrested, sentenced, and repeatedly interrogated. The truth must have been determined by now. Certainly the following three questions should have been answered by now. So, do you think China will be a Soaring Dragon or a Crouched Tiger? Do you think it'll surpass the United States as the World Superpower? Or will it face political turbulence and breakup as its export strategy is disrupted by the current financial crisis and economic slowdown? Is the current surging interests of many people to learn the Chinese language, Chinese art Chinese medicine and Chinese cuisine a sign of the resurgence of China as an economic power? Topic: Buckminster Fuller's View of the Future. If you are reading from facebook, click here.